Panthers captain Ulrich Ostergaard has called for another dominant display against Plymouth. Photo: David Lowndes. Panthers entertain the Devils in a Sunday showdown at the East of England Showground as they bid to return to a share of top-spot in the Premier League Cup Southern Group. 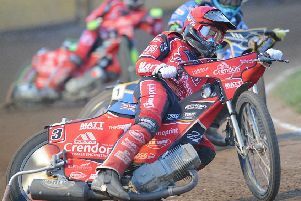 They will take to the track as hot favourites for a fourth successive victory after claiming their biggest away win for more than a decade – 57-36 - in the reverse fixture in Devon on Friday night (April 10). Ostergaard, who top-scored at the St Boniface Arena, said: “We are definitely looking for more of the same tomorrow. We need to pick up from where we left off on Friday. “Everyone rode well down at Plymouth. We all made good starts and fought for every point. “Getting such a big result at a tough track was a great achievement and now we need to keep the momentum going. Bottom-of-the-table Plymouth were then bashed 66-24 at Rye House last night (April 11), but Ostergaard is still at pains to stress there is no room for complacency from Panthers. He added: “Plymouth have some racers in their team like Fish (Ryan Fisher) who had a bad night on Friday but will probably do much better at the Showground. “They also have Kyle Newman back, who was riding in the Elite League on Friday, and he is another important rider. Lasse Bjerre again slots into the number one position for Panthers after a double-figures display on Friday. Plymouth must draft in a guest for injured reserve Sam Chapman who sustained a hand problem in a heat 14 crash on Friday. READYPOWER PANTHERS: Lasse Bjerre (guest), Lewis Blackbird, Ollie Greenwood, Robert Lambert, Simon Lambert, Ulrich Ostergaard, Michael Palm Toft. PLYMOUTH: Guest for Sam Chapman, Ryan Fisher, Jack Holder, Ashley Morris, Kyle Newman, Morten Risager, Sam Simota. THE Peterborough Thundercats also return to the track tomorrow. They take on Scunthorpe Stags in their first meeting since stepping into the Midland Development League in place of the withdrawn Castleford side. That meeting will form the second half after the completion of the clash between Panthers and Plymouth.